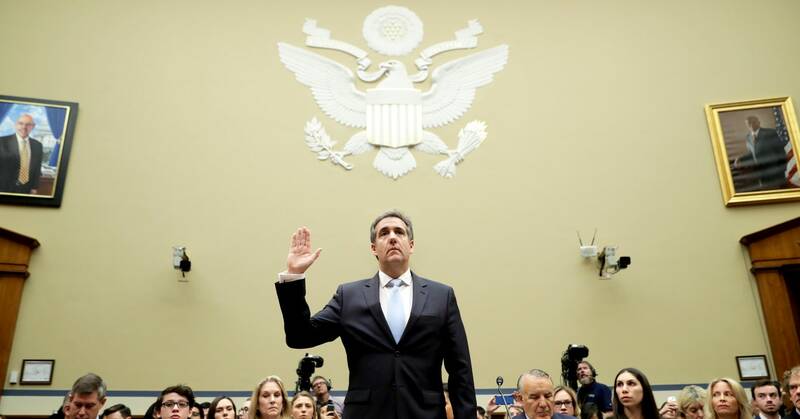 The bombshells and not-so-surprising surprises, both legal and those just plain embarrassing, come on almost every page of Michael Cohen’s 20 pages of prepared testimony for the House Oversight and Reform Committee. Cohen claims that the president knew about Roger Stone’s alleged contact with Wikileaks and Julian Assange, the president wanted Cohen to lie about the Trump Tower Moscow project, the president paid hush money while in the White House, he ordered Cohen to threaten his high school to keep his grades private, he insulted minorities, and so on. And Cohen, knowing that Republicans would attack his credibility, is coming to the table with receipts—documents and exhibits, many in Trump’s own hand, that back up specific allegations. In some ways, his historic testimony Wednesday on Capitol Hill at a congressional hearing carried live on TV and radio, testimony that caused him at times to come close to tears as he testified against the man to whom the lawyer and fixer dedicated a decade of his life, was the first coherent, consistent story of Donald Trump’s behavior during the 2016 campaign—a candidate intimately involved in the details of his campaign and who didn’t expect to win but lied and cheated through the whole endeavor. The question is whether Americans (and Republicans specifically) will believe Cohen? That should actually be an easier question to answer than the House GOP will surely pretend it to be—after all, prosecutors are used to witnesses with credibility problems. The inherent challenge in prosecuting crime is most people involved in crime are criminals, so it’s easy to impugn their veracity. That’s why prosecutors rely on corroborating testimony and evidence to back up witness claims—and that’s precisely what Special Counsel Robert Mueller and federal prosecutors in the Southern District have already done with Cohen. You can rest assured that when they’ve allowed Cohen to claim something or say something, they have corroboration—other testimony, documents, etc.—to back it up. After all, they’re ethically prohibited from allowing Cohen to say something in court that they have reason to believe isn’t true. All of which is to underscore why Cohen’s prepared remarks today should be carefully studied—they’ve been surely carefully vetted by counsel and lawyers (maybe even prosecutors) all with a vested interest in ensuring that Cohen remains a credible witness for any and all future trials. First, Cohen makes three key assertions: that (1) Trump was closely monitoring the Trump Tower Moscow dealings (as Trump would ask, “How’s it going in Russia?”); that (2) he may have known about the June 2016 Trump Tower meeting hosted by Donald Jr.; and that (3) Trump also knew about Stone’s contact with Assange and Wikileaks ahead of the first dump of stolen emails. Together, they begin to assemble a cohesive timeline of a pattern that could amount to a conspiracy: A candidate who knew about the June 2016 meeting in advance, then knew about the Wikileaks stolen email dump beforehand, then went out on July 27, 2016, and made his long-puzzling “Russia if you’re listening” comment. Even before he took the stand, Cohen’s prepared testimony dramatically reset and altered our understanding of the Russia story. Second, Cohen again raises what I’ve always considered one of the most suspicious parts of the Trump Tower Moscow project—the expected $300 million price tag to the Trump Organization. That nine-figure price tag stands out as highly atypical for the business at the time. By 2016, the Trump Organization had gotten out of large-scale projects—it was mostly picking up small licensing deals, a few million here, a few million there. Something about the Trump Tower Moscow project was obviously different—very different. As Cohen’s prepared statement says, “He stood to make hundreds of millions of dollars on the Moscow real estate project.” It potentially stood to gain the Trump Organization something like a hundred times the size of a normal Trump deal at the time. Why was it so out-of-scale (and I’m not just talking about the oversized $50 million penthouse that might have gone to Vladimir Putin himself)? Third, he pierces the façade—which has never been all that believable—that it was possible these projects were proceeding without Donald Trump’s personal oversight or permission. One of the realities reporters and pundits have danced around confronting is the tiny scale on which Trump’s world operates; neither the Trump Organization nor the Trump campaign were sprawling Fortune 100 enterprises, with thousands of employees spread across dozens of offices where it’s conceivable that the left hand legitimately didn’t know what the right hand was doing. The Trump Organization was a small family business—and the campaign was run like one. There were few serious executives or players either not named Trump or, in Jared Kushner’s case, married to one—and in terms of the Trump Organization, perhaps the only two meaningful staffers not named Trump, Cohen, and CFO Allen Weisselberg, are both cooperating with investigators. It’s never seemed all that believable that three central figures—Paul Manafort, Don Jr., and Jared Kushner—three people who were with him every day, people who were in constant contact with him and in constant competition for his affection and gratitude, would have hosted a meeting a meeting in Trump Tower, the building where the candidate lived and worked, with Russians promising gifts and not mention it either before, during, or after. Fourth, Cohen brings Donald Trump’s crimes into the White House—and he brings the literal receipt. Cohen has provideed the committee a “copy of a check Mr. Trump wrote from his personal bank account—after he became president—to reimburse me for the hush money payments I made to cover up his affair with an adult film star and prevent damage to his campaign.” It’s easy to forget that Donald Trump, the president of the United States, a.k.a. “Individual 1,” has already been credibly implicated as an unindicted co-conspirator in a campaign finance felony—a fact that in any other circumstances would garner all but unending wall-to-wall news coverage. Fifth, he gives a precise and completely believable accounting of the confusion over last month’s BuzzFeed bombshell, that said Cohen had been directed by Trump to lie to Congress. It was a rare moment that seemed to break though the noise around the Russia probe, an overt act of criminality that threatened Congress’s own legitimacy, and caused the special counsel to issue an unprecedented statement denying the BuzzFeed report. As Cohen explains, both reports were really correct: He lied on Trump’s behalf, but Trump didn’t specifically order him to do so. Cohen says he didn’t have to—the two had worked together long enough that he knew his role. It’s the equivalent of the “Will no one rid me of this turbulent priest?” question posed, abstractly, by King Henry II that led to the murder of Thomas Beckett. He didn’t have to give the order—because everyone knew what he was saying. Trump’s camp has recently turned to accusing Cohen of being a “rat,” language that typically emanates only from the world of organized crime. Cohen’s testimony, for the first time, does begin to paint a public picture—under oath, under penalty of perjury, from a broken man, whose loyalty to Trump he now admits was misplaced, a man already facing prison—of the Trump world’s crimes as more organized and coherent than they’ve seemed thus far.